"I have attended several barre classes which Cat teaches and in a very short space of time she has helped me to achieve fantastic results. Cat's combination of individual style, extensive knowledge, thorough technique and enthusiastic commitment to her work provides the perfect scenario for success." "Ballet Sculpt is a fantastic class that combines dance technique warm ups with pilates. As someone who doesn't love the idea of traditional gym sessions and fitness classes, this is the perfect mix of strength and flexibility to tone your body and give you an all over workout." [Regarding the suggestion to start a YouTube channel] "You will be great. You are as good as my ballet teacher I had growing up from Juilliard. Everyone should get access to your brilliant teaching!" 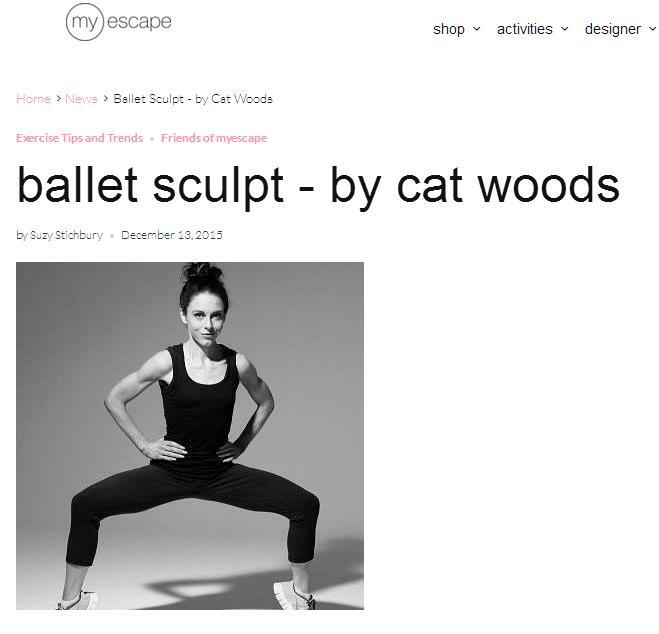 "Thank you for putting Ballet Sculpt Classes run by Cat. The classes are fantastic. We all love them. Cat is a great teacher. She is technical, fun and professional. The classes really help me a lot. It fixes my previous weakness and problems. I have become so strong now, not to mention they are so much fun and enjoyable. I am looking forward to attending the classes every week." 1. "Just did a barre class with Cat. She was AMAZING! Great attention to technique whilst getting a great workout. Haven't sweated like that in a barre class ever! Would love to see her on more evening classes. She was fantastic! Great class and great instructor." 2. "Cat is amazing! Her barre classes are my favourite and I felt comfortable from day 1. She is so knowledgeable and welcoming." 3. "Cat Woods is a very knowledgeable yoga teacher and I absolutely loved the 1.5hr class she just covered for Zoltan. I have done lots of yoga over the years and her class really stood out with true technique and professionalism. One of the best teachers I've experienced here at Fitness First." 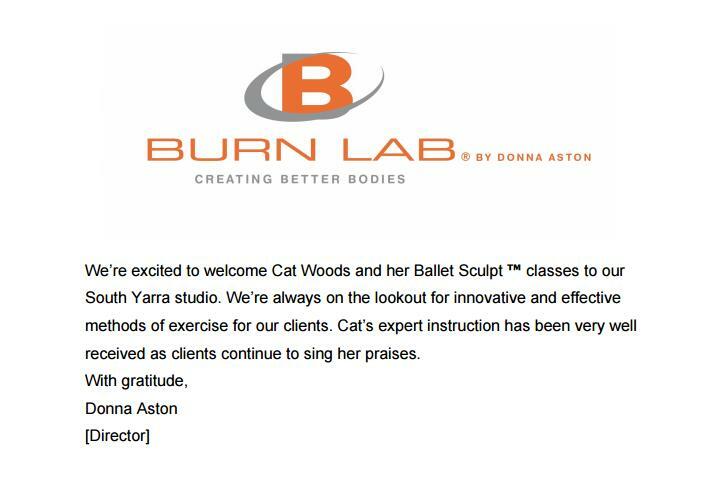 Testimonial from Director of Burn Lab and international trainer, Donna Aston. September 2017. Not for the first time, I had a lovely pregnant Ballet Sculpter today. Ballet Sculpt is modifiable to pregnancy and in fact, strengthening the glutes, hips and legs in preparation for childbirth and staying strong post-pregnancy is a highly valuable investment in your health, your strength, stability and ability to look after yourself and your mini-Sculpter. Plus, how amazing is it that the human female body can build another human? If we can do THAT, surely we can plie all day, travel to our bucket list places, create the art we envision and do the work we know really matters.